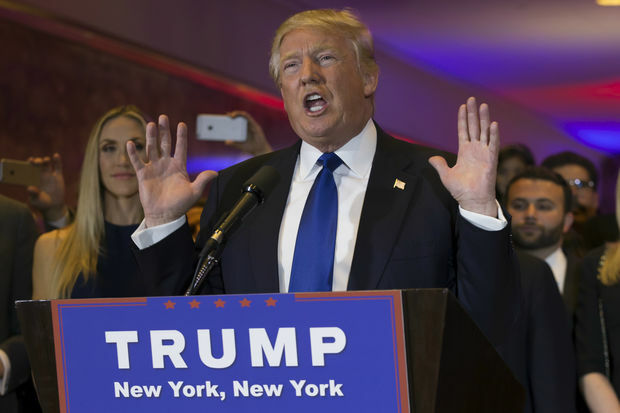 Front runner for the Republican presidential nomination Donald Trump gave a speech at Trump Tower in Midtown Manhattan on April 27, 2016, to mark his victory in all five primary races. MIDTOWN — What can we expect from a Trump presidency? Lots of Midtown traffic woes and "Trumplock," according to Gridlock Sam. Trump Tower at 725 Fifth Ave. is the first Manhattan home of a modern president. It will likely have a 4-year security ring, be where the commander-in-chief stays when he's in town and become a magnet for protesters, former city Department of Transportation Commissioner Sam Schwartz said. "In a nutshell, there will be more traffic disruptions and 'Trumplock' ahead," he said. As president elect, Trump's residence had already become a protest epicenter by Wednesday night for thousands of people who waded through traffic from Union Square, burning flags and carrying large signs. "One can expect that whenever some group is unhappy with his policies — and one need not to have a crystal ball to know that that's going to happen — instead of going to Washington, they'll march on Trump Tower," Schwartz said. Sanitation trucks had already been parked around the tower for election night and remained for Wednesday's protests. By Thursday afternoon, NYPD barricades cut off traffic to nearby streets. Schwartz expects security measures will stretch through Trump's presidency, diminishing the amount of traffic through that part of Fifth Avenue and rerouting it to Park Avenue. Midtown already becomes snarled in traffic whenever motorcades of commanders-in-chief and international dignitaries come to town. Trump is likely to exacerbate that with frequent visits back home, Schwartz said. "We can expect some presidential gridlock. It's going to be 'yuge,'" Schwartz said. Schwartz expects first lady Melania Trump to be even less tied to Washington and stay in Manhattan more often with her large security detail. It wasn't immediately clear what security measures the Secret Service will put in place around Trump Tower. Neither the agency nor the NYPD immediately returned requests for comment. But the Secret Service kept the area around Barack Obama's Chicago home in relative isolation with robust security measures for 8 years. With agents posted at either end of Obama's block, neighbors could play Frisbee in the street but had to notify officials if they wanted to have friends drop by. By the time the 44th president was re-elected, residents had grown used to the forced solitude. "It's the same, with a lot less traffic," one neighbor said in 2013. President-elect Trump has yet to name his cabinet members, but several locals are reportedly on the shortlist including Chris Christie, Jamie Dimon, and former mayor Rudy Giuliani. Giuliani, Schwartz noted, will likely move about town to visit his favorite spots like the opera, sparking even more headaches for drivers. "He loves Opera. You can expect Rudy to travel with an entourage," Schwartz expected.